Each time we go to a doctor appointment, the smell of the soap in the Mercy offices takes me back. We'd pick up the phone in the hallway, say our names, and ask to be allowed in to see our son. Seven weeks, several times a day, scrubbing hands and arms with a brush and that soap for several minutes. A year and a half later, we did it again with son #2, only for two weeks that time. There's no waiting quite like NICU waiting. We waited for ounces to be gained, milliliters to be digested, temperatures to regulate, heart and breathing rates to remain stable. There were days we waited for our baby to be allowed to eat again. We waited for answers to loops in the belly and blood in the stool. The early morning phone calls were hard. The not knowing was harder. The hospital was filled with other women given the option of having their full-term babies room-in. I had to plan my visits to the incubator based around the feeding schedule for "touch time." Other mothers got to pass their newborns to visiting friends and family, but for awhile we were barely allowed to touch our firstborn because too much stimulation is not good for a baby who was only 29 weeks gestation. The days were long, and the nights were longer. Most evenings I left the hospital crying. Leaving a brand new baby at the hospital while you go home is not at all a normal nor a maternal feeling. Somehow, we survived those weeks of waiting, and in a way it seems like a blur now. 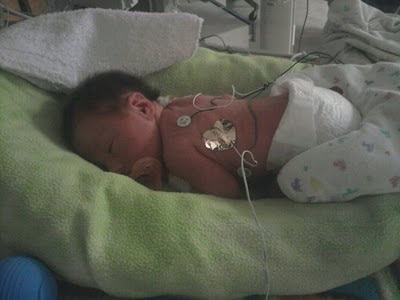 Our second round in the NICU was eerily like coming home. We knew the routine. The nurses remembered us. We knew our youngest was in good hands.The waiting was hard that time as well, but for different reasons. Initially we were told he'd only be there a day or two. But when the eating issues kept up, I couldn't help but think how unfair it was. We'd already done this waiting game before. Plus I had the mama-guilt of having to divide my time between a toddler at home and a baby in the hospital ... and the pump every three hours. There is no such thing as a typical NICU experience. In those weeks I learned how to pray like never before, and I learned how to ask for help. We saw our oldest with wires and tubes hooked up to machines, but we never had to experience a baby having surgery or not bringing our baby home at all. The experts don't know why I have babies early,and I don't know why we had to become NICU parents. I still don't understand why some things come so easily for some people, and the rest of us have to wait. The smell of soap at the doctors' offices transports me back each time to our NICU days. It might sound strange, but along with the pit-in-the-stomach memories it conjures up, the scent also reminds me of where we've been and what God has faithfully brought us through. And if He's been faithful before, He will be faithful again. He is with us in the waiting.